I used maseca brand masa harina. I followed the instructions on the package. That’s very strange for me! I never follow instructions! Anyway, measure 2 cups of masa harina into a large bowl. Add 1/2 t. salt and 1 1/4 cups water. Mix well, and set aside while you make the filling. Warm the olive oil in a large skillet on medium heat. Add the shallot, garlic and herbs, and cook till the shallot starts to brown. Add the pinto beans. Stir and cook. Add the chopped spinach, and cilantro, and put the lid on the pot. Cook till the spinach is just wilted. Transfer to a large bowl and add salt, pepper and cheese. Heat a griddle over medium high heat. Take a handful of dough – just enough to comfortably fit in your hand. Press and turn, press and turn, making a flat disc about 1/3 inch wide. Use your thumb to press the edges, so they don’t crack. Take a small amount of dough in your fingers and press it into the middle of the disk. Fold the edges over to enclose the filling, and then press and turn, press and turn until you have a flat disc again. I used some extra dough to cover the cracks where the filling tried to find its way out, but I’m not sure that’s officially sanctioned behavior! 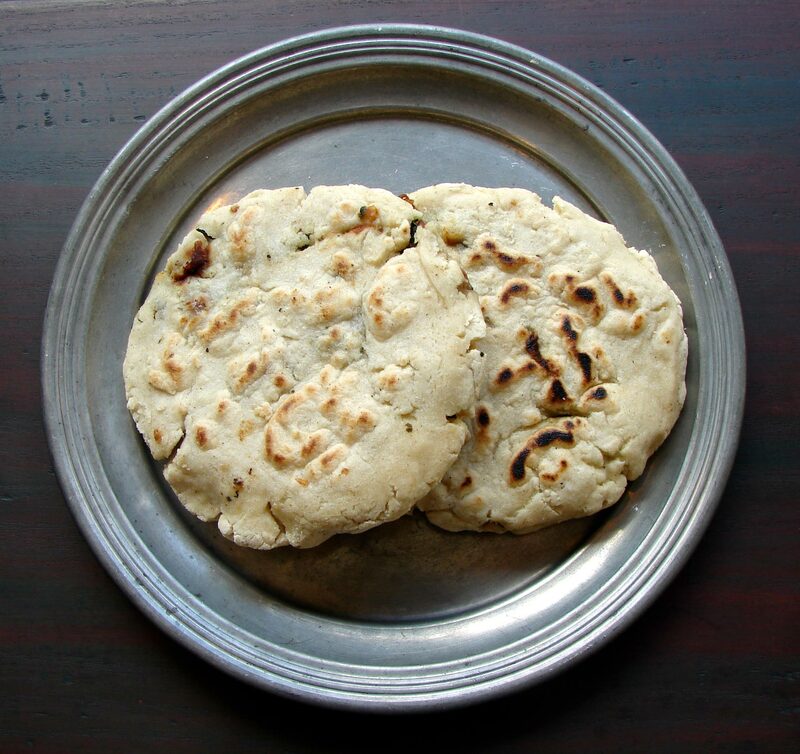 When you have a nice, flat, neatish disc, slightly larger than the palm of your hand, place it on the hot griddle. Cook until it has brown spots. It should look like a leopard or a giraffe, apparently!! You want it to cook at least five minutes on each side, so if it gets brown too quickly, turn the heat down a bit. We ate it with a salad of baby arugula and tomatoes and a bowl of lemony soup. It would be nice with some kind of salsa – I’ll try that next time! This entry was posted in basic pie filling, beans, crust, recipe, Uncategorized and tagged gluten free savory pastry, masa harina, pinto beans, pupusa, spinach by Claire. Bookmark the permalink.